FUN FACT: Did you know you could click on the pictures in all the mosaics I post to reveal more captions and titles? Yeah, I didn’t think that fact was particularly that fun either. On Christmas Eve, Jack and I decided we’d go explore more of London, especially as there were plenty of Christmas-related things happening in the central area for Christmas Eve. Our first stop was the local Sainsbury’s, just to have a quick bite. 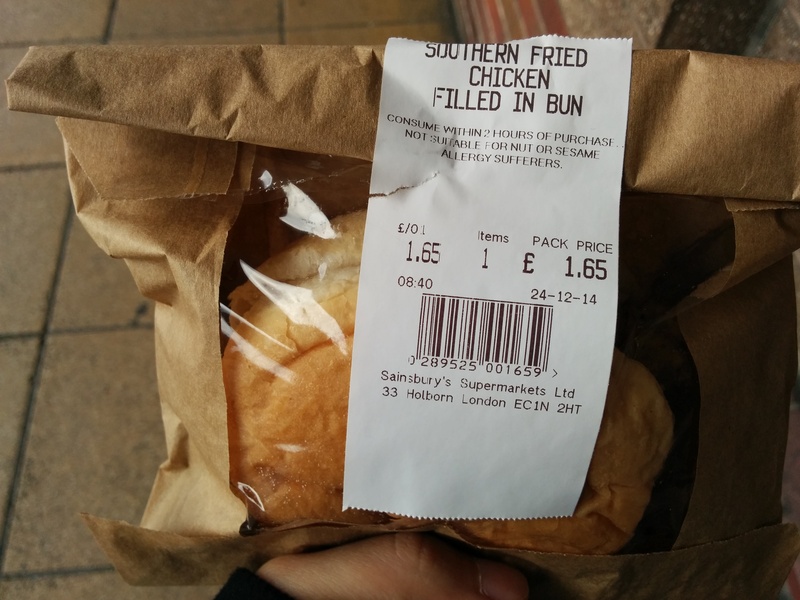 Not really southern fried, seeing as it was pretty soggy inside the bap. Being deep into December, the air was sharp and the sky was so, so blue. I thought it’d be fun if we checked out the Tate Modern, but being the klutz I am, I failed to realize that the Tate was closed on Christmas Eve until we arrived there. Still, the architecture around the area was quite intriguing. What was open on Christmas Eve, anyway, was much more interesting than modern art (although I’m sure there are those of you who would disagree). The South Bank Christmas Markets were just beginning to fill up so with a happy heart and quick feet we made our way over to Grill My Cheese where we ordered the Baby Got Mac toastie (£6), a sandwich filled with pulled pork, barbeque sauce, macaroni and cheese and, well, more cheese. The sandwich seemed flat at first but then we realized just how much cheese was wedged in between those thin crusty slices. We also found a German marshmallow stall, and for £2 we bought ourselves two sweets of whipped mallow covered in flavoured chocolate. The first we tried was almond and honey and the second was Irish cream. Both were sweet but much lighter than expected, and not at all chewy as you would expect your typical marshmallow to be. Still chuckling over our find, we began to follow the Southbank shoreline. Along the way we saw yet another public Christmas tree and a vividly coloured skate park nearby; received Starbucks samples of a caramel mochaccino (as if we needed more sugar); posed with Paddington Bear; and stumbled across a smaller market near the Globe Theatre. Caramel mochaccino sample from Starbucks. One of the stalls at another market closer to Tate Modern. 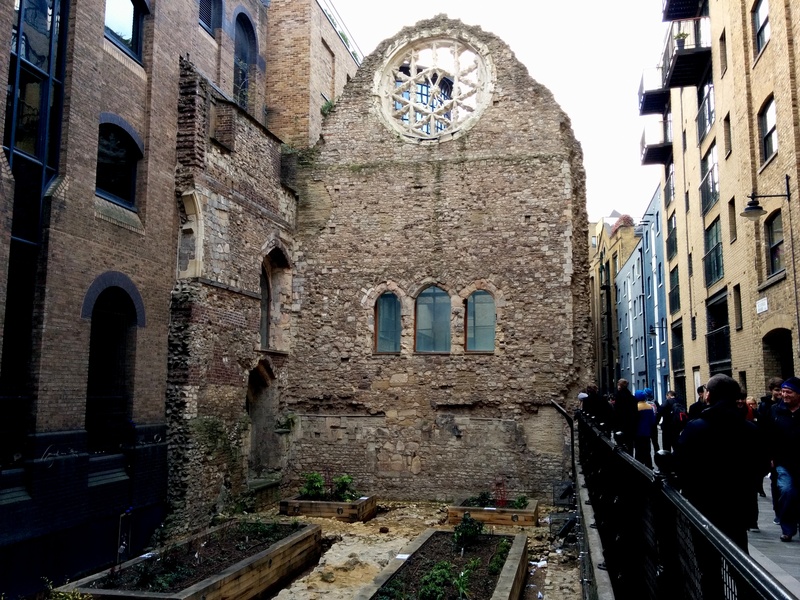 Now if you’re finding your way to Borough Market and are coming in from the west along the south shoreline, you’ll very likely find yourself in a narrow street walking past the ruins of Winchester Palace. I don’t know why, but I find the one standing wall of this former building almost fantastical, like a corner of another era tucked into this time. I suppose one could argue the case that London is full of these little corners, but for me this is perhaps my favourite. Near the Winchester Palace Ruins. 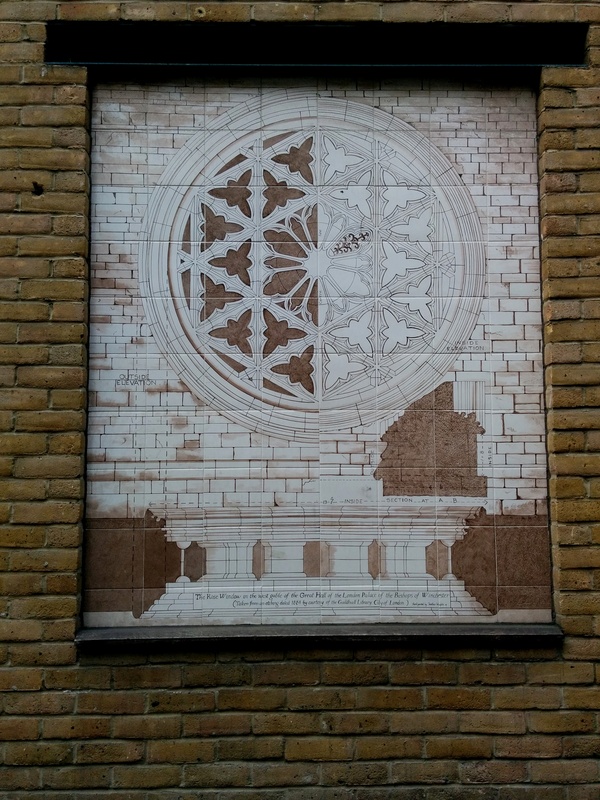 Of course, I could also really enjoy the place because it heralds our proximity to Borough Market. This time we were ready. we had withheld buying anything else at the South Bank Market or eating at any other restaurants so that we could enjoy Borough Market without regrets. Our first meal was a baguette stuffed with roast pork, fennel and homemade applesauce: savoury, sweet and juicy all at once. Massive vats of paella bubbled nearby, pots of candy offered themselves to the passerby and Jack was an absolute darling, letting me buy £4 worth of Turkish delight from a friendly vendor, who took the time to pick out almost one of every flavor offered there. We found another Paddington as well and finally bid farewell to Borough Market. We began to walk northwards this time, over bridge and passing building after street after building. Our next destination, St. Paul’s Cathedral, was supposed to have a service held at 4 PM and so we arrived before 3 PM, joining the queue that already wrapped almost all the way around the building. The structure itself was gorgeous and the prospect of singing Christmas carols in such a place was such a wonderful thought, as Jack and I enjoyed one bite of Turkish delight at a time. Inside the area was packed and we were told not to take any pictures during the service, but I can tell you the singing was wonderful and the story they told went far beyond Jesus’ birth to discuss even the reason for His coming and the way to find reconciliation with God. Being in such a massive place made me feel small, but the following realization that we were all strangers joined, even if briefly, in song and in spirit, was something that transcended both space and self. Finally, the service over, happy and warm, Jack and I took the bus and the train back home, finding several more Christmas trees along the way. Home, we played a few games and shared the last of the Turkish delight over a glass of wine, and so ended the night.